The beautiful caverns of Dos Ojos were the setting for my most favourite and ground-breaking shoot to date. Kristina and I first heard about Dos Ojos in the resort pool on our second day in Mexico. The one-legged Canadian sipping his mai tai, proudly claimed to have visited almost everything worth doing in the area, but this spectacle was one of his highlights. It was unknown from most of the Quintana Roo tourists, with barely any mention of it at our hotel. It's just as well, as its majesty wouldn't be quite so apparent if it were crammed with people. Hidden under the jungle canopy at the end of a long and dusty road, Dos Ojos is a flooded cave system that still hasn't been fully explored. It is one of the planets longest and most impressive underwater cave systems, made up of 28 cenotes at 51 miles long. Derived from the Mayan word 'dzonot' meaning 'sacred well', a cenote is a natural limestone sinkhole giving way to pristine groundwater. 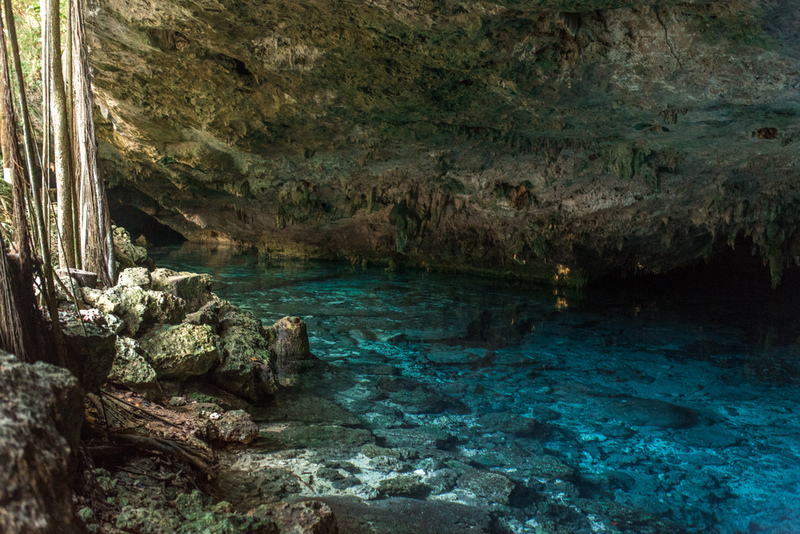 'Dos Ojos' refers to two of the larger caves, the 'two eyes', that were believed to look to the underworld. As an experienced SCUBA diver, I've never seen water so beautiful since off the coast of Fiji. We peered into the darkness of the caves, watching the bats dodge stalactites, and knew we'd struck gold. We wandered between cave entrances for a while, before settling down at the second eye. We watched as swimmers and divers disappeared and emerged from the tunnels, their torch lights whipping around and revealing patches the filtered sunlight couldn't reach. I couldn't wait to get in the water. But first, we wanted to take some 'dry' pictures. Watching and photographing Kristina pose on the rocks in her white bikini, occasionally dipping her toes in the water, was everything I needed in life at that moment. But the water was soon calling. I encased my camera in its new Outex underwater housing and waded in. We set off exploring one of the nearby branches, finding the setting sun bathing one stretch of rocks in some stunning light. The crystal clear waters shimmered in beautiful blues and greens, occasionally illuminating submerged stalactites below. We soon realised we were facing a race against the sun as we chased the light through the cave. It was time for our biggest challenge. We had only practised this once before in an open air cenote a few days earlier, which is testament to Kristina's talents. We wanted to create a majestic vision of her diving underwater, in amongst the fish, rocks and stalactites. With the sun setting and water temperature dropping, our challenges began to mount. Our learning piled up during each dive. She began to tire, I was getting colder, the ISO was getting higher, but the pictures were stacking up. Much too soon, the Caribbean sun had set. The cave was dark and deserted, and we reluctantly pulled ourselves from the now-chilling water. It's a shame we didn't have more time, but it only makes me prouder of what we accomplished from the 6 or so dives we made. The other caves will have to wait for another time. We learnt so many lessons from this experience - not just how to swim, model and photograph underwater. Which, by the way, turns out is much harder than anticipated. I've learnt that this is the kind of art I want to be producing. Every day. The kind that pushes boundaries, and shows off lesser known parts of the world in new ways. The kind that makes you look twice. The kind that is hard. A few may already know my ultimate plan is to conquer the land, sea and air. I guess I'm almost halfway there. I will be writing a follow up post soon about the challenges facing this shoot and underwater photography. If there's anything you would like to include or know, please leave a comment or email me at hello@matthewthompson.photography. Follow me on Facebook to find out when I release new content too! Thanks!